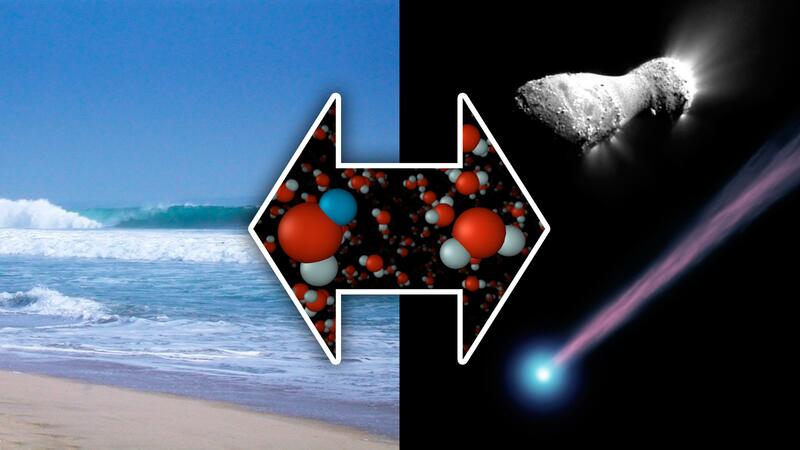 New measurements from the Herschel Space Observatory have discovered water with the same chemical signature as our oceans in a comet called Hartley 2 (pictured at right). 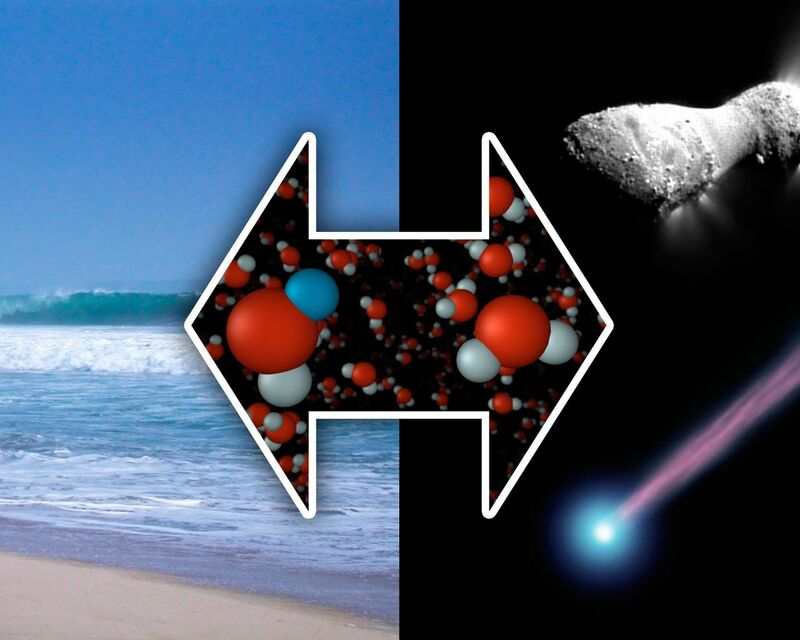 Previously, astronomers thought icy comets impacting on a young Earth had deposited only about 10 percent of the water comprising our oceans. The new findings, however, suggest that comets played a much bigger role. The image of comet Harley 2 at top right was taken by NASA's EPOXI mission. 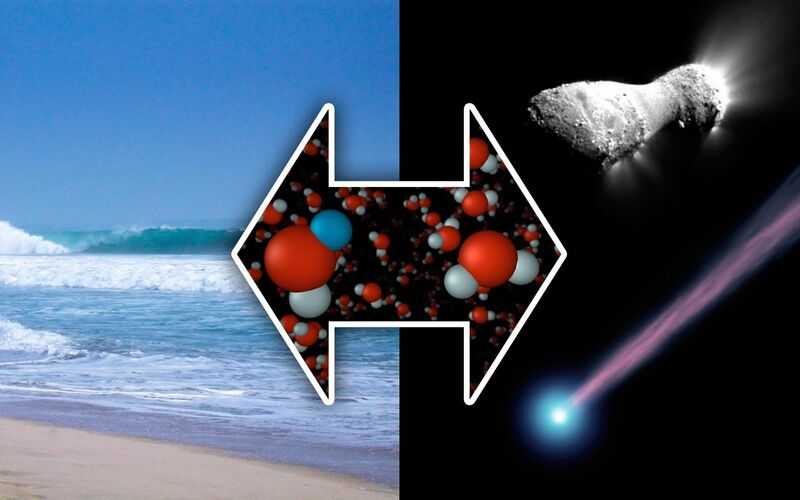 The image at bottom right is an artist's concept of a comet. Using the Herschel Space Observatory, astronomers have discovered that comet Hartley 2 possesses a ratio of "heavy water" to light, or normal, water that matches what's found in Earth's oceans. In heavy water, one of the two hydrogen atoms has been replaced by the heavy hydrogen isotope known as deuterium. Hartley 2 contains half as much heavy water as other comets analyzed to dateHerschel's "Heterodyne Instrument for the Far Infrared," or HIFI, was used to obtain the spectral signatures of the water molecules, as shown here in the graphs. The image of comet Harley 2 was taken by NASA's EPOXI mission. Herschel is a European Space Agency cornerstone mission, with science instruments provided by consortia of European institutes. NASA's Herschel Project Office is based at the agency's Jet Propulsion Laboratory in Pasadena, Calif., which contributed mission-enabling technology for two of Herschel's three science instruments. The NASA Herschel Science Center, part of the Infrared Processing and Analysis Center at Caltech in Pasadena, supports the U.S. astronomical community. Caltech manages JPL for NASA. More information is online at http://www.herschel.caltech.edu, http://www.nasa.gov/herschel and http://www.esa.int/SPECIALS/Herschel/index.html.